In William Safire’s delightful book Fumblerules: A Lighthearted Guide to Grammar and Good Usage, he illustrates each of his basic rules with a statement that clearly violates the rule—such as “Don’t use no double negatives” or “The passive voice should be avoided.” The section on the importance of proofreading begins with the obviously unproofed sentence above. Proofreading is the final step in the writing process—first write, then edit, finally proof—but in today’s fast-paced work environment, it’s a step that’s often overlooked. Why work for two weeks on that quarterly report only to have it marred with errors when it hits the boss’s desk? A good proofreading will catch any typos, misspellings or punctuation mistakes before anything ever gets that far. (Grammatical mistakes should have been caught during the editing stage.) Here are our top five tips and tricks for proofreading well. Put it away for at 24 hours. Although not always possible, putting some time between the writing-and-editing phase and the final proofreading will allow you to check your writing with a clearer eye. The more you can approach it as if it’s new to you, the easier it will be to catch mistakes. Do something non-verbal. Check on those budget figures. Pick out a picture for the new brochure. Or run an errand you’ve been putting off. When your brain engages in something completely different—especially an activity that engages the visual or mathematical part of the brain—you’ll come back to words on the page with a fresher eye and more alert verbal acuity. Read backwards. As absurd as it sounds, reading backwards forces you to look at every single word and punctuation mark. Don’t worry: it’s easy. You’ll read the whole word, one word at a time, but you’ll take it in slowly instead of in a gulp as we tend to do when reading something familiar. When we read “normally,” we’re reading for meaning, and that often induces us to read what we intended to say instead of what’s actually on the page. The whole point of proofreading is to catch the mistakes we didn’t intend to make. Are there words that often trip you up? Make a list of those and be sure to check them carefully in your writing. Rinse and repeat. That’s right: If it’s an important document, or if you’re signing off on a print job, proofread again. Better yet, have someone who has no connection to what you’ve written give it a careful reading—and then proofread again. It’s surprising how much we miss. This is the writer’s version of “Measure twice, cut once.” Proofread twice, and be much more confident in what goes out. Once you start proofreading regularly, you’ll find it’s easy to make it a habit—one that’s guaranteed to make you look more professional (if not downright smarter). 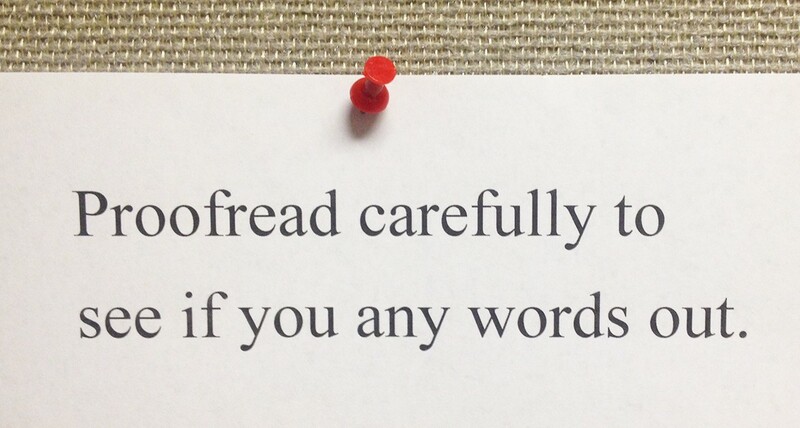 Do you have other proofreading tips? Let us know what works for you. Great tips! It blows my mind how many spelling errors we see printed large and in front of everyone. A lot of times, it turns out to be the easier words that people may have a habit of skimming over!